EdX does not support this tool. The recommender provides learners with a list of online resources related to the course content. These resources are jointly managed by course team members and the learners. The most common use of the recommender is for remediation of errors and misconceptions, followed by providing additional, more advanced resources. For example, if a learner is working through a physics problem, the recommender could be used to show links to concepts used in the problem on Wikipedia, PhET, and OpenStax, as well as in the course itself. The recommender can help fill complex knowledge gaps and help move learners in the right direction. Learners and course team members can complete the following tasks with the recommender. 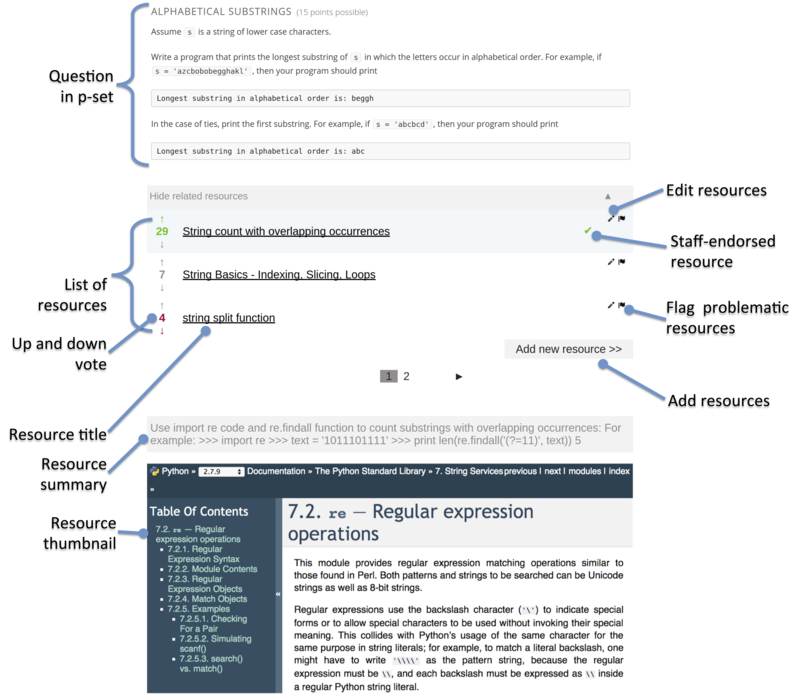 Edit existing resources and work jointly to improve the quality of resources (for example, give an informative resource summary). Manage quality by voting for high quality resources or flagging resources as spam or abuse. Course team members can endorse useful resources or remove irrelevant entries. If you use the recommender, you should inform learners through course content or course updates about the tool. An example of a recommender in a course follows. The upper part of the figure illustrates a question in a problem set where the recommender is attached. The middle of the figure shows a list of resources and several gadgets for users to work on the resources. The bottom portion shows additional information about a given resource on mouse-over event. Course team members should be sure to review all supplemental materials to assure that they are accessible before making them available through your course. For more information, see Accessibility Best Practices for Developing Course Content. Before you can add a recommender component to your course, you must enable the recommender tool in Studio. To enable the recommender tool in Studio, you add the "recommender" key to the Advanced Module List on the Advanced Settings page. (Be sure to include the quotation marks around the key value.) For more information, see Enabling Additional Exercises and Tools. To add a recommender to a course, follow these steps. Go to the unit in the course outline where you want to add the recommender. Under Add New Component, select Advanced. In the component that appears, select Edit, and then specify settings as needed. Whether to take users on an introduction tour when they see the tool the first time. If selected, the first time (and only the first time) a user sees the recommender, there will be a short guided tutorial. Whether to disable the user interface functions which are under development. Because these are untested and under development, please leave these disabled unless otherwise advised by edX staff. How many resources you want to show in each page of the resource list. How many page icons you want to show in the pagination control (that is, the page range). The icons for pages from (current page - page range) to (current page + page range) will be shown. Optionally, open the unit in the LMS and suggest some resources. Copyright © 2017, edX Inc.